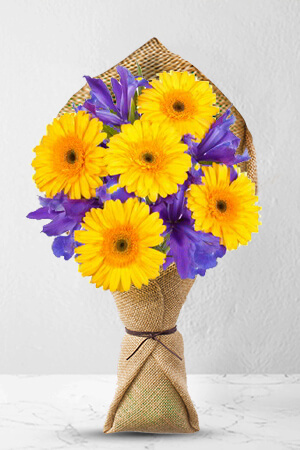 Thoughts go to sea and sand and all things pleasurable in summertime at the sight of the stunning colours of the yellow Gerberas and the purple Iris in this startlingly eye-catching bouquet. You can send Sea and Sand equally well to a man or a woman.Vase not included however if you wish to make a fantastic impression, may we suggest a Premium Vase to complement Beaches. Your birthday reminder makes it so much easier to order again. It saves me a lot of time and hassle. Your systems really work. Well done! Brillient - Ordered the flowers Sunday night UK time - delivery to Address in Brisbane area before lunch Monday Eastern Australia time ! No fuss, just job done!! Flowers arrived as stated and the person was very happy with them. Great choice - easy to order - payment straight forward - arrived on time. A reliable service to order flowers for delivery on the other side of the world. Flowers and delivered and my sister loved the surprise of getting them.